Essence is a drugstore brand that is available in many countries, but in the United States you can find it at Ulta, HEB, Fred Meyer and online. It is a high quality brand for low cost. 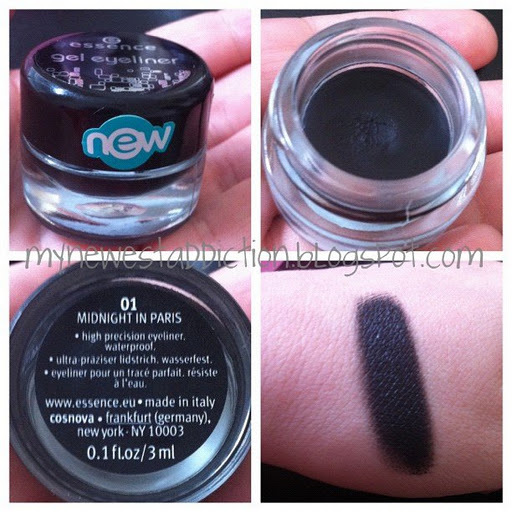 I wanted to review the gel eyeliner in Midnight in Paris which is their matte black one. I feel like not enough people know the greatness of this brand. At my Ulta it is on a very narrow end cap that I walk right by almost every time. There is an occasional collection display somewhere in the store but it’s never very visible. Let’s get right into the review. This gel liner is an ultra soft, whipped-mousse-like consistency. It dries super fast (like so fast that I did this swatch and snapped the picture and it was already solid) and doesn’t move. When I say it doesn’t move I am not even kidding. I tried to wash it off immediately afterwards and it wasn’t having it. After several hours and hand washing sessions it did finally come off but it is some serious stuff!!! That wasn’t even with a base under it. When applying this eyeliner I use a MAC 263 or a Sonia Kashuk bent liner brush. The consistency of this liner allows it to apply very smooth and easily. It doesn’t force you to drag the brush several times and there is no skipping.